These wild caught pieces of Alaskan Halibut were meaty and satisfying, and what I really loved was the flavor. Halibut has a hint of sweetness to it — in the way that lobster is sweet. Its flavor pairs perfectly with the saltiness of the prosciutto and, like most fish, takes mere minutes to prepare. I often take the protein on our dinner plate and transform it into a salad for an all-in-one meal. The first time we enjoyed this Halibut, which was flash-frozen to maintain peak freshness and so easy to pull from the freezer for an easy dinner, my thoughts turned toward the flavors that would create a hearty, healthy, quick to prepare, one-plate meal. If you are a frequent visitor to my website, you have read the words quick, speedy, and easy often. I love to cook. It is fun and relaxing and I enjoy the creative outlet immensely. But putting dinner on the table amidst work, kids’ activities, meetings, laundry, etc., can be a grind. There may be different reaons for different people but, the bottom line is, dinnertime tends to be a busy time! So, I try to focus on meals that are not only healthy and delicious, but meals that are uncomplicated and can be pulled together in a short amount of time and, ideally, with a moderate amount of pots and pans! The simple, three-ingredient tomato sauce is the perfect dressing for this salad yet works beautifully as a sauce for simple sautéed or baked chicken. Feel free to mix up the fish as well, using cod or flounder or whatever white fish you truly enjoy. The balsamic tomato sauce is equally delicious spooned over pan-seared or baked chicken. In lieu of a salad, you may also pile the fish (or chicken) and sauce on top of a bed of couscous. 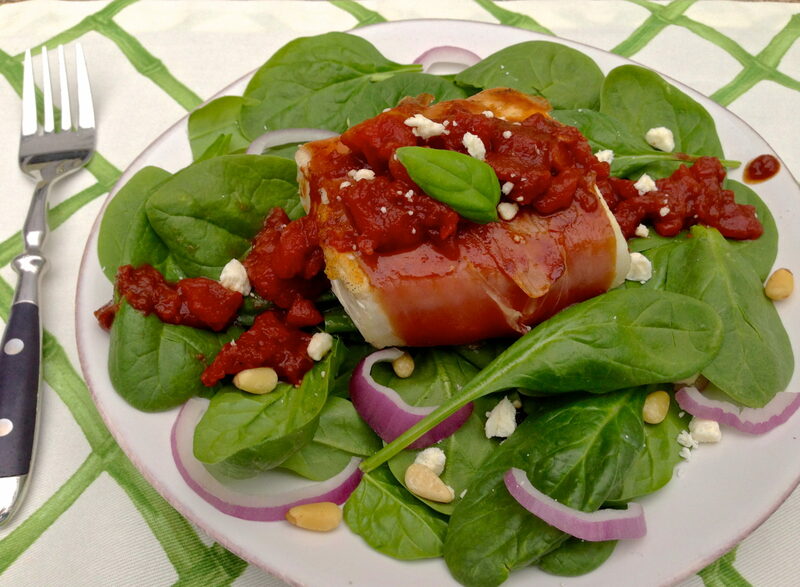 Make a bed of spinach on your plate, sprinkle with desired salad add-ins, then top with a piece of prosciutto-wrapped halibut and a generous spoonful of sauce. Sprinkle with a bit more feta, if desired. As an option to the salad recipe above, you may serve with a drizzle of syrupy balsamic vinegar. To make your own version of a costly aged variety, simply simmer an inexpensive balsamic vinegar on the stovetop until reduced by about half. I have a food party tomorrow. I would love if you could remember to bring this wonderful dish by… I’m trying to promote more fish eating. I will stop over and share the link. Thank you, Diane! I can’t wait to try this! I’m trying to introduce more fish to my family. 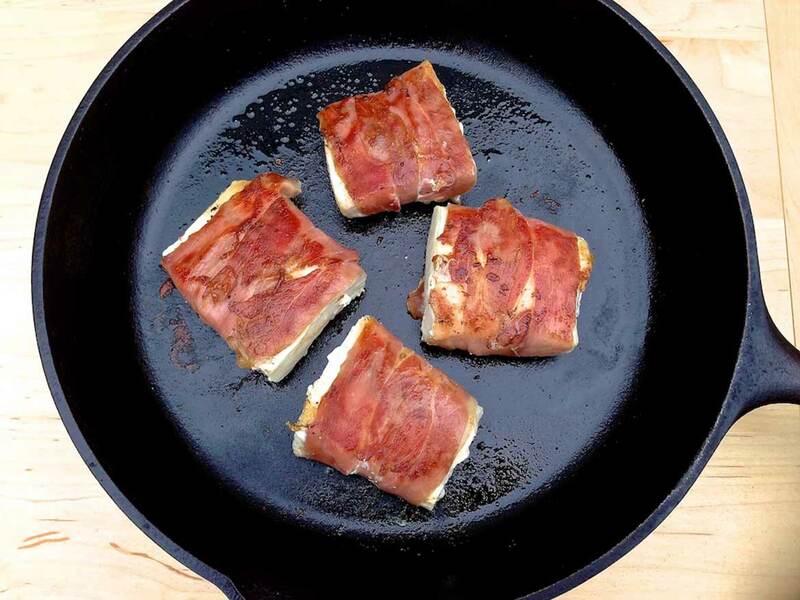 Wrapping it in prosciutto sounds like a great way to do that. My pleasure, Adelina, and I hope this ends up being a good way to get your family to eat more fish. If you like salmon, my Parmesan crusted salmon recipe is a favorite here! Happy Ground Hog day Ann! This really sounds great! I love halibut and swordfish , all seafood really and we just don’t eat enough of it. I’ve always wanted to cook with prosciutto. Hi Mary Lou! So glad the prediction is for an early spring: ) I love the flavor prosciutto imparts, especially paired with the fish. Hope you enjoy! This is the most delicious dinner!! I have made it 2 times now, the 1st for my children…they went CRAZY it was so good, and the 2nd for a dinner party, they also went crazy!! Extremely easy and super delicious!!!! I am smiling from ear to ear, Daryle! Thanks so much for the great feedback. I am so glad this recipe was a double hit!